Some of the many fruits and vegetables that grow in the Dominican Republic and their descriptions. Try a ripe yellow banana, a sweet, juicy pineapple or a tree-ripened mango. All are just too wonderful. Very ripe and juicy Lechosa / Papaya being sold in the streets. Lechosa / Papaya is a fruit grown on large trees in tropical climates. There are male and female trees and their offspring are the sweet fruit papaya. Here in the Dominican Republic it is called lechosa. It is a large fruit green when unripe. When the fruit is ripe and ready for eating it is soft and yellow with some darker spots here and there. 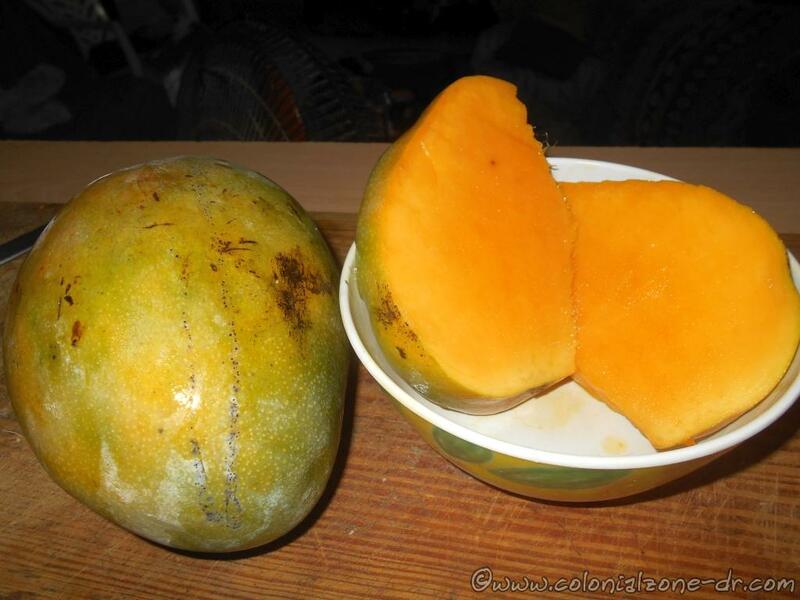 It is best eaten plain and is quite juicy. One of the best ways to serve it is to blend it with some milk or carnation and ice. This is really tasty. The little black seeds inside are sometimes eaten, they have a little of a spicy taste. They are used as a substitute for pepper when dried and ground. Mavi also spelled Mabi (pronounced Ma-Vee or sometimes Ma-Bee), is a staple in the Caribbean. 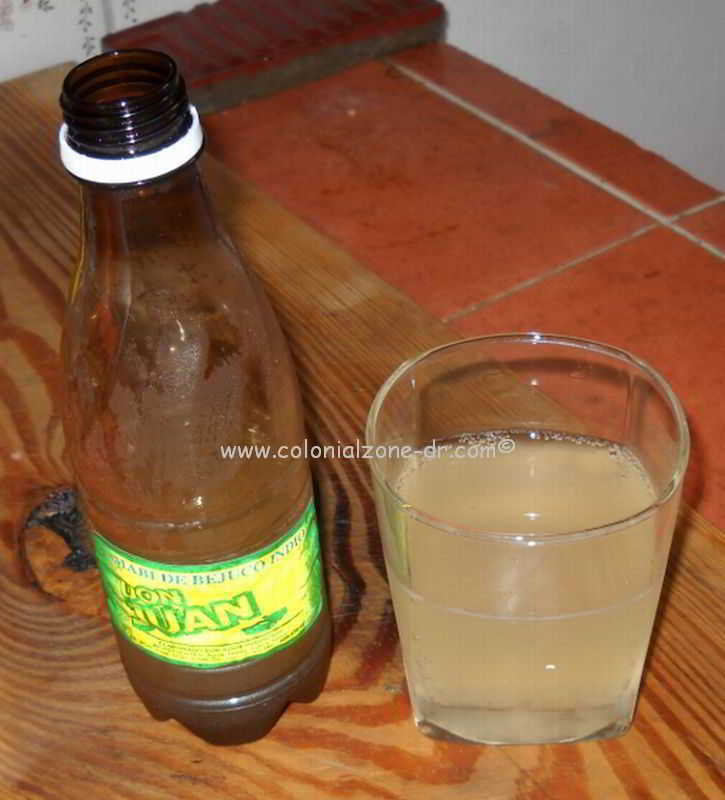 This drink is made from the bark of the Mabi tree is also known as mabetree, soldierwood or seaside buckthorn. This bark is rich in glucosides (what is that you may ask? Wikipedia definition here) The bark is removed from the tree and boiled to make a tea. Sugar, usually raw or turbinado sugar is best as it has a little hint of molasses flavor to it. Many make this tea into the fermented drink by adding some yeast and letting it sit for a few days uncovered. It can also be made into a non-fermented drink as well. It is said to lower blood pressure, reduce cholesterol, and to make men more potent. In Dominican Republic Mabi de Bejuco Indio is usually made locally and can be purchased in the Colmados and corner markets. It can be found in almost any type of bottle as the maker uses what is available. It is very refreshing and can be sometimes potent so beware. Ripe aguacates / avocados ready to be eaten. 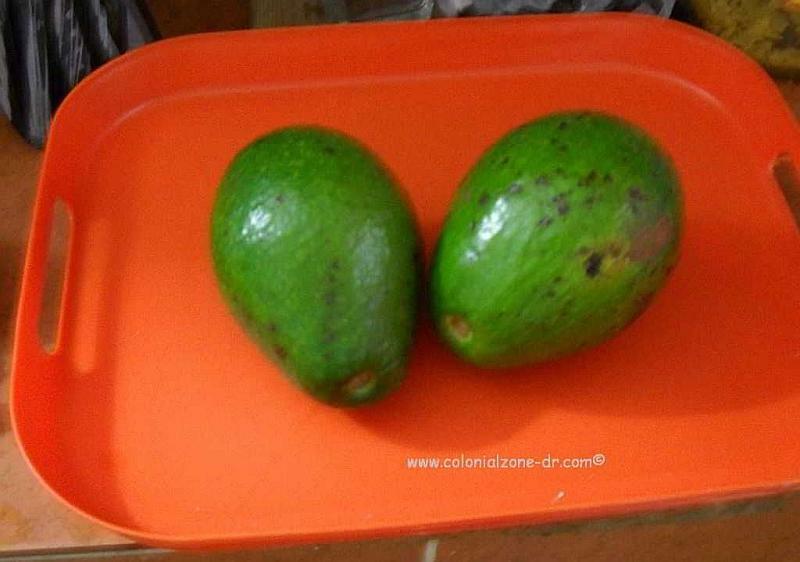 The Avocado of Dominican Republic has a variety of types and flavors. It is one of our most imported fruits. We import both organic and non-organic versions of the fruit. Some avocados are dry and not as sweet and others have a much different taste than the ones on the grocery shelves that most people are accustomed to eating. When this creamy, nutty-flavored fruit (yes it is a fruit, not a vegetable) is in season it can be found in abundance in every market, on the streets and in most restaurants at a very reasonable price. Dominicans use this beautiful green colored fruit on salads or just eaten plain with a little límon/ lime-lemon to accompany any meal, soup or stew. 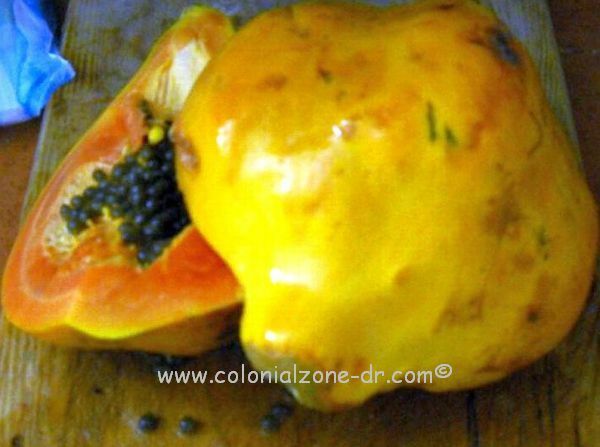 Make a sandwich using this fruit on some pan de agua and you will be quite pleased. Aguacate is also used in many cosmetic preparations. Just remember, it is fattening (about 75% of an avocado’s calories come from fat) so don’t over indulge. Avocados have more potassium than bananas, have the highest fiber content of any fruit and are rich in B, E and K vitamins. They are also known to lower the bad cholesterol and help with the good HDL levels. 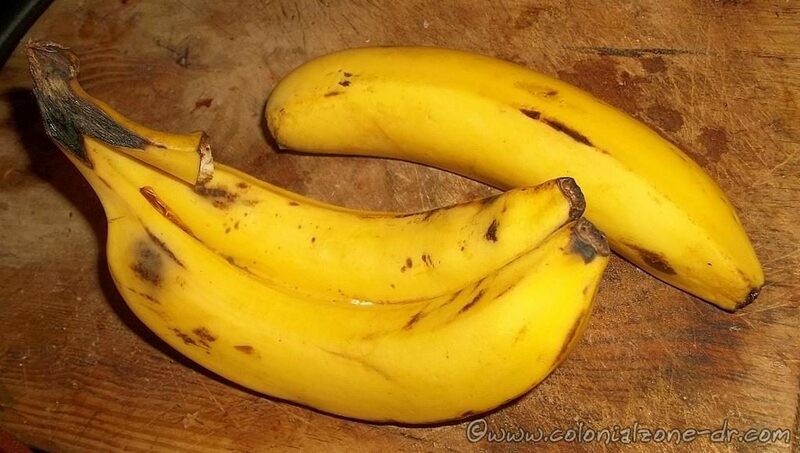 Beautifil and prefectly ripened Guineos / Bananas. Guineo / Banana (the sweet type of fruit you can eat raw) – Platano/ Plantain (the hard fruit that is very starchy and needs to be cooked) are some of the most recognizable fruits of the world. 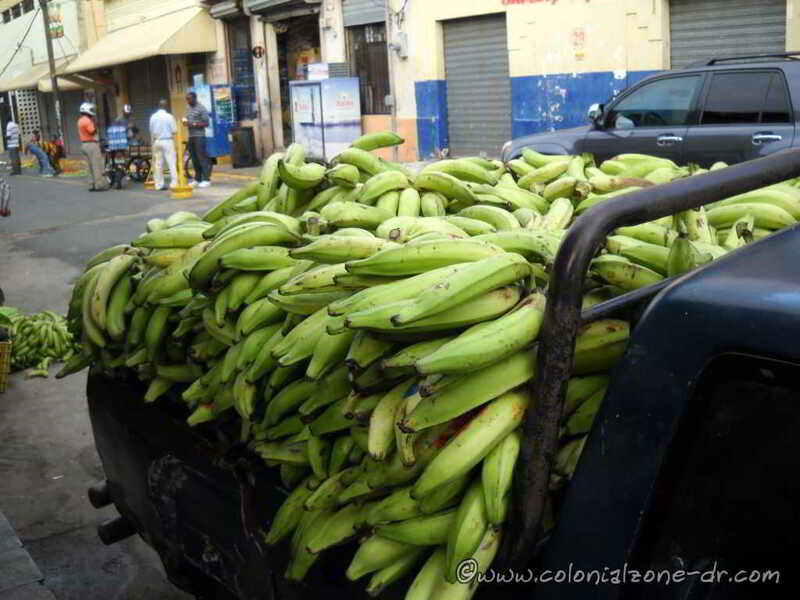 A truck full of Platano/ Plantain in the market. Here in Dominican Republic we love our bananas. They can be purchased in almost every corner store (Colmado) and in the streets. A sweet banana is a very nice fruit to refresh yourself and get some of the sugar your body might need on a hot day. 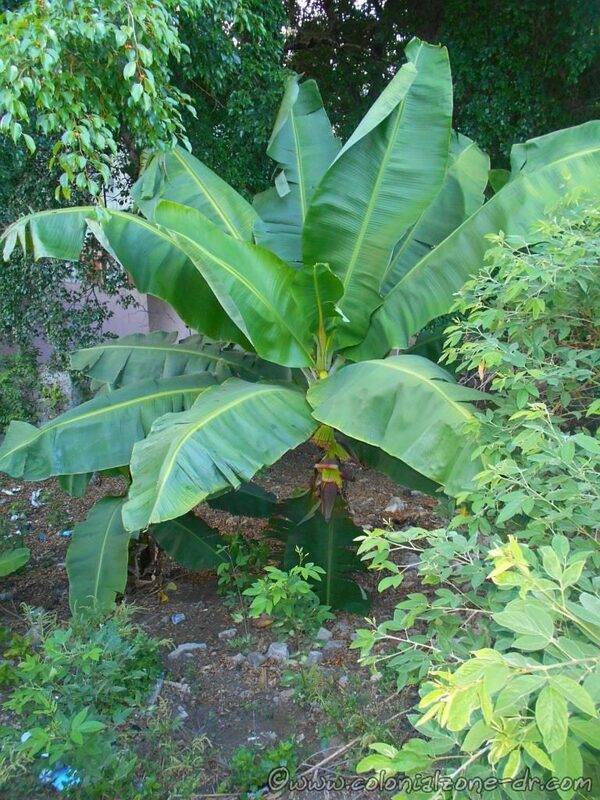 These large, big leaved plants can produce many fruits. 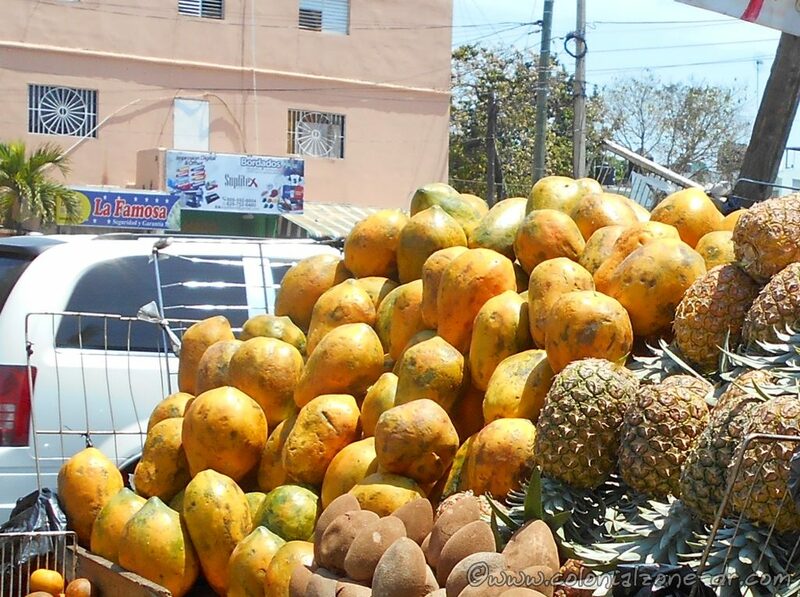 They taste better here in the Dominican Republic because they are ripened right on the plant and not picked green like the ones shipped to other destinations. Choose a red, yellow or green banana/ guineo that can be eaten without cooking. 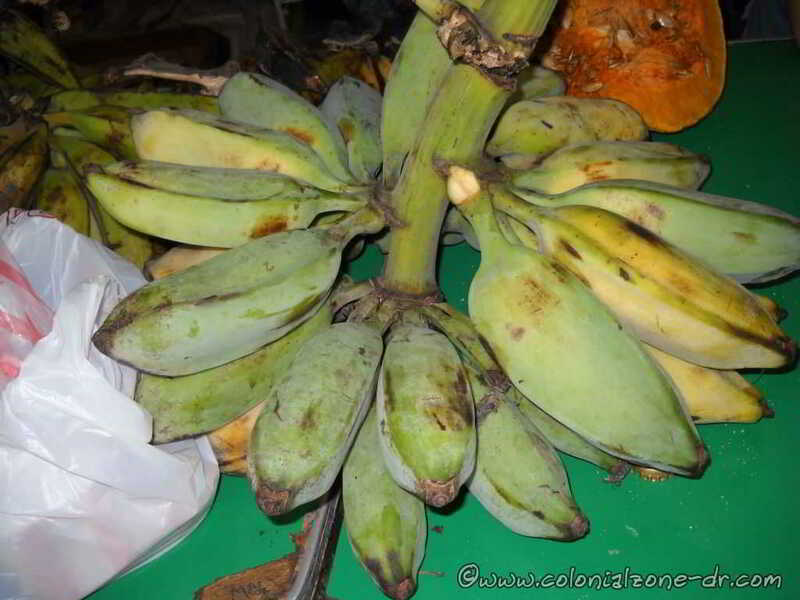 Try a green to yellow platano that needs to be cooked to be eaten either plain or served in many imaginative forms. A fresh sweet yellow banana, nothing tastes or smells better. For platano cooking information check out our recipes page. 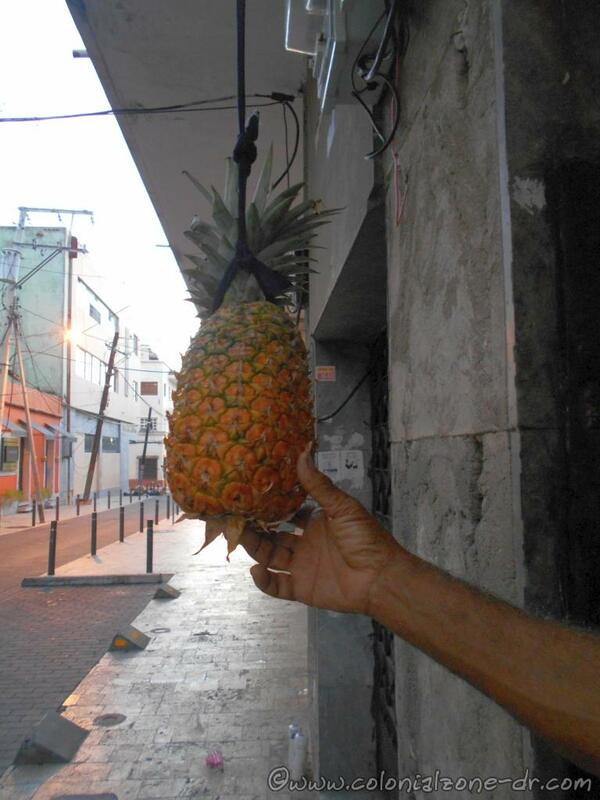 The pineapple, simply called piña here, can be found growing in Dominican Republic. 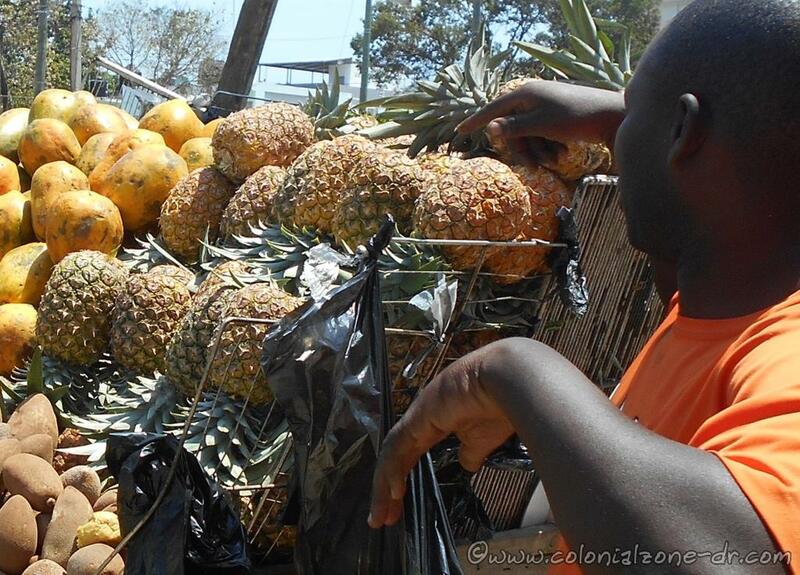 The ones sold in the streets here are usually vine ripened. This makes the piña taste so much better than ones you get outside of the country. They can be purchased in almost any spot in the country, especially when they are in season. Vendors always have them either whole or cut for you to enjoy right on the spot. Some vendors cut them in a spiral way that you can hold like a lollypop. Do not be afraid to eat the core as it is soft and sweet just like the outside fruit. 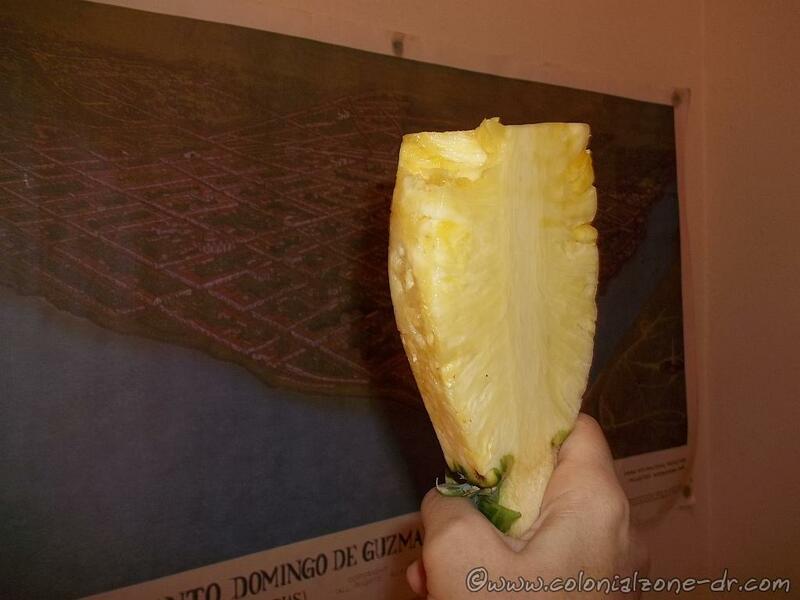 A pineapple / piña, sweet and juicy, ready for eating. Ripe Mangos being sold in the street. 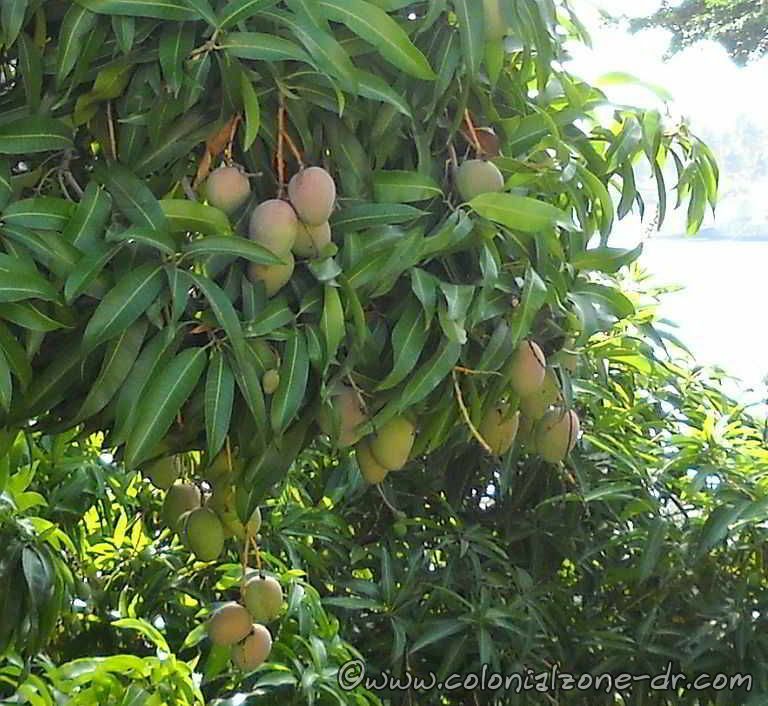 The Mango is a well-known fruit that grows on a tall tree. 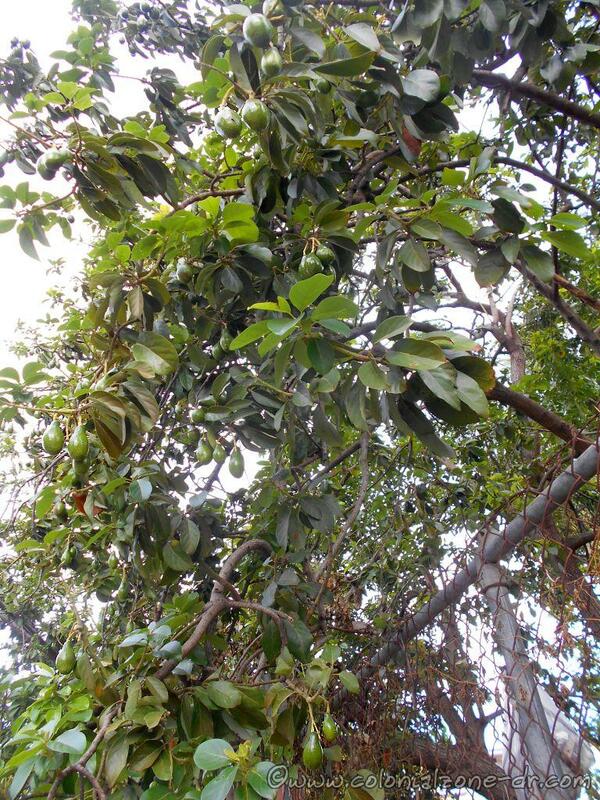 The tree makes lots of fruits that are very sweet and juicy. 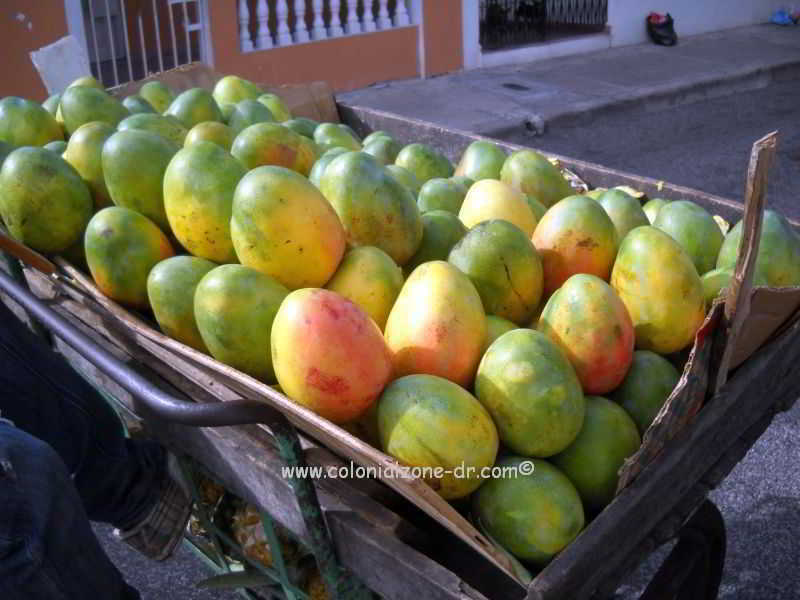 There are many different varieties of mangos grown in DR.
My favorite type of mango, Banilejo. Very large, sweet and juicy. The mango makes for some messy eating and it is well worth the mess. I suggest eating it with a knife instead of just biting into the fruit. This way you get all the juice in your mouth and not down the arm. Also, the pulp is very stringy and if you don’t have dental floss or a toothpick handy you will be digging at your teeth all day trying to remove the little fibers from between and this can get annoying. Another way to enjoy an overly ripe mango is biting through the skin and just sucking out the juice. It may sound strange but you should try it. It is very satisfying. Mango fruits are wonderful and refreshing so please do not pass them up. They make a wonderful juice with some ice, milk or carnation, and a little sugar in a blender. I love to freeze this milkshake type drink for a freshening icy treat. Yes, we do have earthquakes in Dominican Republic. 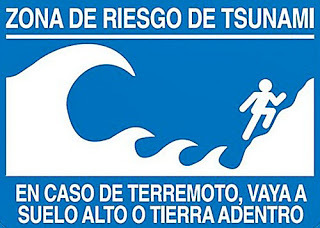 We call an Earthquake in Spanish a Terremoto or Temblor de Tierra. Whatever you want to call them we do have this earth-shaking phenomenon occurring here on our island and we do have many earthquakes. The island of Hispaniola does have seismic activity almost daily, as with many places throughout the world, but the activity is so small that usually it cannot be felt. Every so often the quakes are strong and they can be felt. You can feel the earth move and sway under your feet! The island of Hispaniola, part of the Greater Antilles chain of islands, rose out of the sea due to volcanic action. Dominican Republic has a long history of volcanic and seismic activity. The tallest mountain on the island, and for that matter in all of the Caribbean, is Pico Duarte. This mountain was at one time an active volcano. It rose out of the sea starting with this mountain and it is still rising. Many of the under water caves are not under water now. Don’t worry about Volcanoes for now. There are no active volcanos on our island. There are two major fault systems or lines that run through the island. In the North Hispaniola Trench. It is located just offshore running parallel to the north coast. The other is the Septentrional Fault Zone which runs from the North Hispaniola Trench to the Cibao Valley and Santiago. The Septentrional Fault Zone is responsible for most of the earthquakes in Dominican Republic’s history. The Mona Passage is the water pass that divides Puerto Rico and the Dominican Republic in the northeastern Caribbean. This area is very earthquake prone. Since the water level in this passage between the two islands is quite low it is very susceptible to Tsunamis. This passage has very fast flowing and dangerous waters with shifting currents that occur when the Atlantic Ocean and the Caribbean Sea meet. Map – Fault lines/ fallas sísmicas running through the island of Hispaniola. 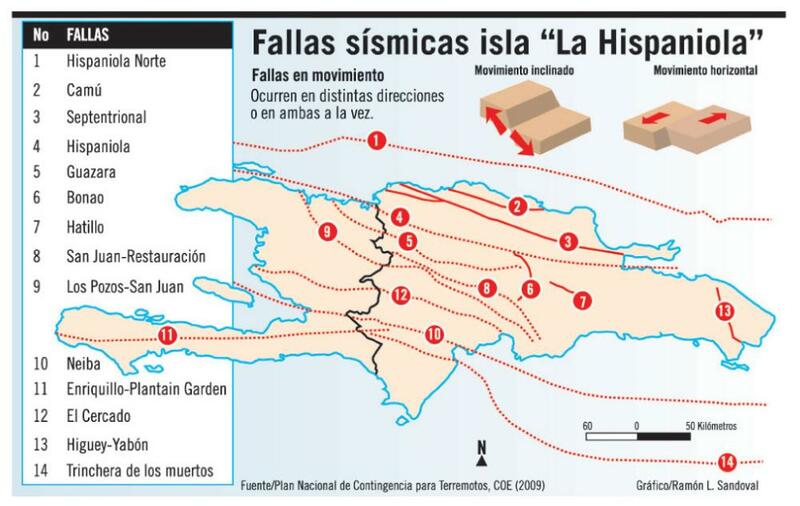 There are also many smaller fault lines/ fallas sísmicas running through the island of Hispaniola. This is a map from Emergency Operations Center (COE) showing all the lines running through Dominican Republic and Haiti. 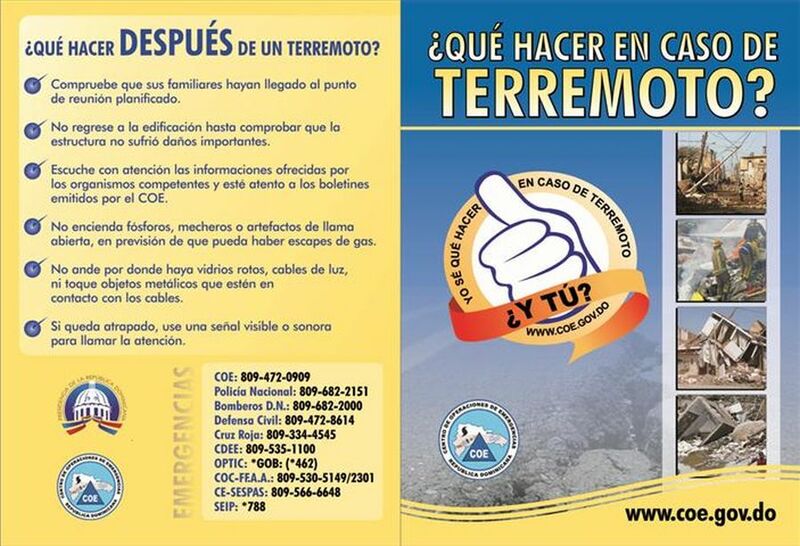 Below are the instructional brochures put out by the Emergency Operations Center about what to do before and after an Earthquake happens. They are in Spanish. Click on the images to see the images to enlarge. Many people say many different things one needs to do to be safe during an earthquake. Stand in a doorway, don’t stand in a doorway. Don’t go outside, get outside and away from buildings. Get under something inside your house, get in the “Triangle of Life” / “Triangulo de Vida” around a piece of furniture. While others say you need to “Drop, Cover, and Hold On.” / “Agacharse, cubrirse y agarrarse”. Our suggestion is to do a search and see what you should do in case an earthquake happens. Make a plan with your family and loved ones what to do and where to meet in case of an emergency situation. We also suggest if you are coming on vacation don’t worry about it. Just come and enjoy. Leave all the worries at home and relax. Earthquakes do not happen often and the hotel staff will be there to inform all on their procedures. The largest earthquake on record in recent history for the Dominican Republic was August 15, 1946. It was recorded at 8.1 and centered in Matanza in Maria Trinidad Sánchez, Nagua on the northern part of the island (a large tsunami hit the coast from Arroyo Salado to Cabrera and left areas under water for about three weeks was recorded at that time). *1961 – 6.6 quake southeast of Santo Domingo. 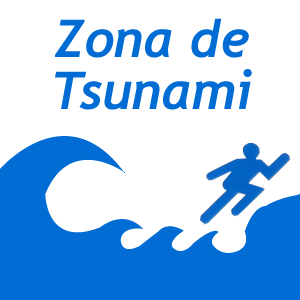 *1971 – 6.0 quake registered in the Azua area. *1991 – 7.0 quake recorded in the Central Mountains and San Juan de la Maguana area. 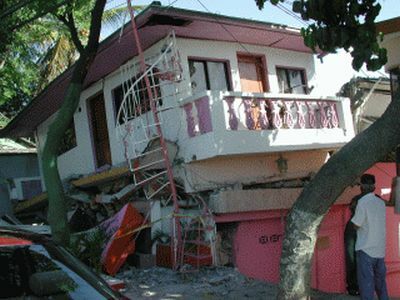 *March 1993 – a 5.2 earthquake affected the south and southwest parts of Dominican Republic along the Mona Passage. *April 1993 – a 5.7 earthquake affected the Cibao region. 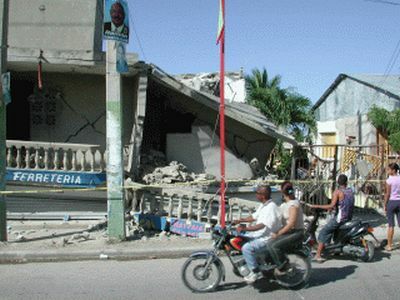 *June 1993 – a 5.1 earthquake affected San Francisco de Macoris area in the northeast. 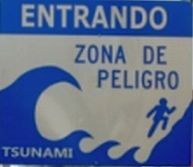 *January 22, 2012 – a 5.0 in the East near La Romana. *February 4, 2019 – a 5.3 quake at 10:33AM. 31km SSE of Boca de Yuma, Dominican Republic. People felt it in Punta Cana, Santo Domingo, Haina, Bani, Las Terrenas and many other locations in the country. There was a 9.0 earthquake when the Europeans occupied the island on December 2, 1562. It destroyed the cities of La Vega and Santiago. A quake estimated to be a 10.0 happened on October 18, 1751 and devastated the southern region. A terremoto estimated to be 11.0 happened on May 7, 1842 destroyed the north of Haiti and much of what is now the Dominican Republic. There have been many earthquakes and tsunamis resulting from the tectonic-plate motions that have occurred in the history of the northeastern Caribbean. 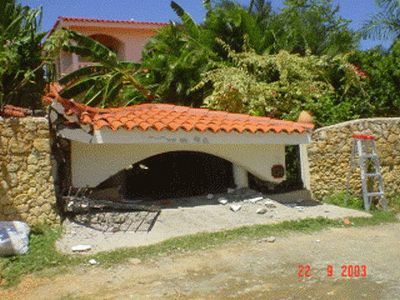 At 11:45 pm on 22 September 2003, a M 6.7 earthquake severely shook the northern part of Dominican Republic. It caused extensive damage to buildings in the major cities of Puerto Plata and Santiago along with landslides in the outlying areas. There were also several large aftershocks (over 200 in all) that happened in the days and hours following this quake. 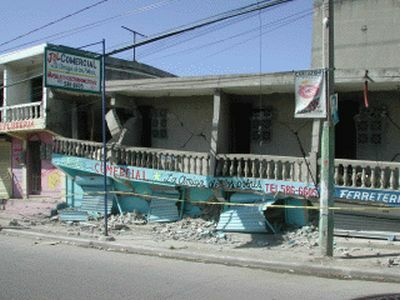 Here are a few pictures of an earthquake that happened in September 2003. 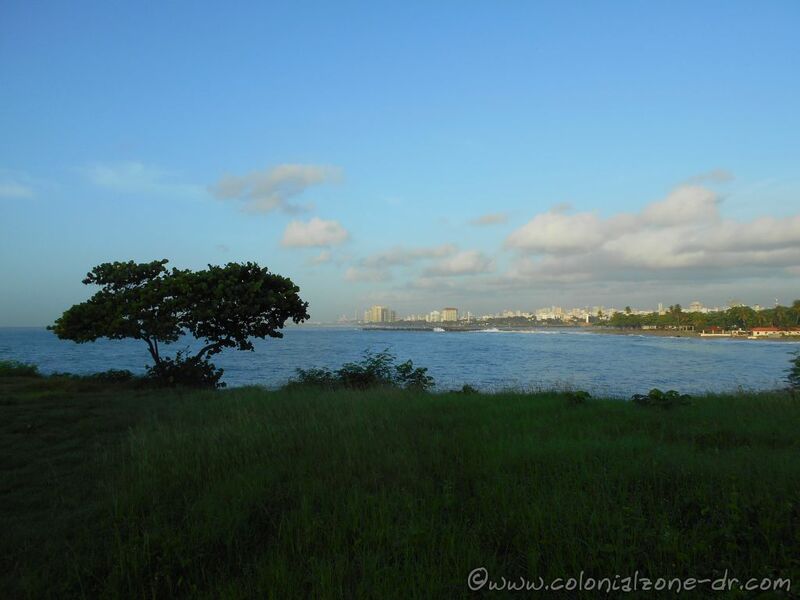 These were taken in the Puerta Plata area by our friend Cochman. The Earthquake Alarm (Amazon) can wake you up and alert you the moment a quake starts giving you more time to take cover. *Operates off of a 9-volt battery. *Loud distinctive alarm to wake you up. *Can detect earthquakes miles away. I have heard many people use a detector and they say they work quite well. I recommend getting one if you live in any Earthquake prone area. *The Dominican Republic Emergency Operations Center (COE). They now offer a downloadable App for emergency Alerts – Alerta COE. 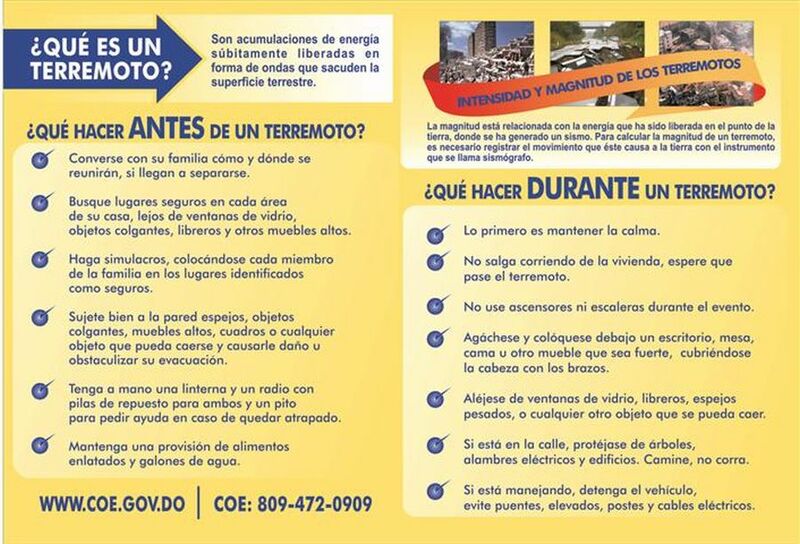 Other instructions on how to prepare for an earthquake and other interesting web sites about earthquakes. *Quakes – Live Earthquakes Map and other interesting maps. *Earthquake forecasting and hazard analysis. *USGS Earthquakes Hazards Program has all the Earthquakes listed in the world for the last 7 days. The latest in USA and surrounding areas (including Dominican Republic – sometimes called Mona Passage) with an earthquake of Magnitude 2.5 or greater. All other areas of the world are listed when they have a quake with a Magnitude 4.0 or greater.